Use Google Trip Planner to get where youre going! Trip planner data is accurate & updated to the best of our ability. Please note the planner may not run smoothly on Google Chrome. Detours will not be included on the Trip Planner, so call 330-762-0341 for detour information. METRO's real-time bus tracking system has arrived. 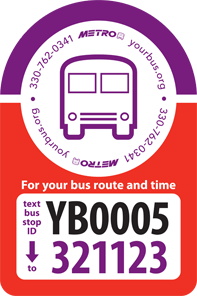 Now, you can text to find out when the next bus is leaving from your stop, you can watch your bus moving on a fancy map, you can download the MyStop app or you can sign up for alerts. So many ways to know when your bus is here! METRO transports more than five million passengers annually to work, to school, to medical appointments and to some of the best places in town. Make sure you take advantage of our many different services. METRO is here to help you get where you need to go, however you need to get there. Whether you're a first-time transit passenger or a seasoned rider, we've put together some information we hope will make your trip a smooth one. Access our trip planner, system map and helpful how-to videos. Relax and enjoy your ride.